In the first short chapters several young people, in different parts of the world, discover themselves in violent situations. They are identified as graduates of a secret service academy - well trained in marksmanship, martial arts and the usual tradecraft and linguistic abilities expected from spies. They are the cream of their generation, highly intelligent and patriotically motivated. They discover that each has had their cover blown, they cannot reach their controller, and people are trying to kill them. Four of them make contact and report the situation - they agree that they are out in the cold, and though they have enough money, there are a limited number of places where they can find safety for any length of time. They have already heard of the 'accidents' that killed the other graduates and they all have scars to prove the dangers they have faced. It is at this point they remember "Contact Zero" - the sanctuary all spooks have heard of - the safety net for agents either out of favour or simply expendable. 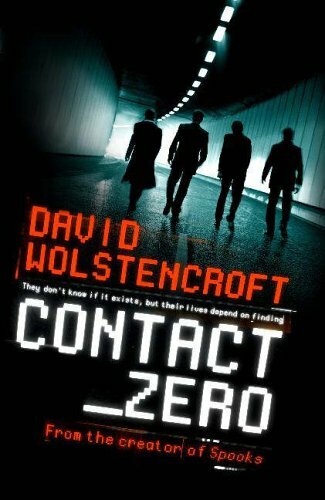 The four remaining agents meet to discuss how to find "Contact Zero", and start looking for clues - any evidence that some covert signs on the web, might be useful to reach safety. They discover there are tests to pass, riddles to solve and endurances to suffer. They stick together to pool their intelligence and travel wherever the signs point, but the tests get harder and though they pass them, there are more, and some of the friends they make are not as trustworthy as they hoped. It is disheartening for them to discover there are agents aware of their presence in every country they choose. It's a nice long book and, cliffhanging all the way, it's a really rattling good yarn.